Lord Teverson’s mention of the GLA’s work on ‘licence lite’ “One of the unsung things in the energy market is licence lite, which is being explored by the Greater London Authority. It is about small independent producers, in particular community schemes, being able to supply directly through local networks to final consumers at a consumer price, thus not needing subsidy for that energy. I would like to explore how that great initiative—unsung by DECC, I think—can be expanded more quickly and effectively throughout the United Kingdom. A useful intervention by The Lord Bishop of London with the following “I echo many of the points already made in this debate, but I shall not repeat them. At the same time, from a London perspective, with our growing population and increasing demand for electricity, which could be as much as 4% a year, I am also clear that the Mayor’s call for a change in the system which currently prevents distribution network operators from installing more capacity in the network without first receiving a formal request for a connection to the system from individual developers, deserves immediate and urgent attention. 13 June 2013: The House of Commons Library has issued a useful briefing note on the Energy Bill. Included in the note is a summary of discussions on concerns of how community energy schemes will operate under the new complex electricity market reform (EMR) regime. Difficulties in obtaining the full reference price for the electricity they generate, resulting in lower income per unit of electricity generated. March 2013: Ofgem’s new FIT quarterly report provides an update on the take-up of Feed in Tariff eligible technologies across the UK. London (as at 31 December 2012) has a total of 39.38 MW of FIT renewable capacity installed – as with the rest of the country, the vast proportion of this capacity is made up of PV (99% in London). This is an increase of 4.25 MW of capacity over the previous quarter. 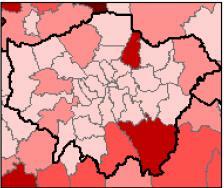 Progress remains slow in London which – with the North East – trails all other UK regions by a significant margin. 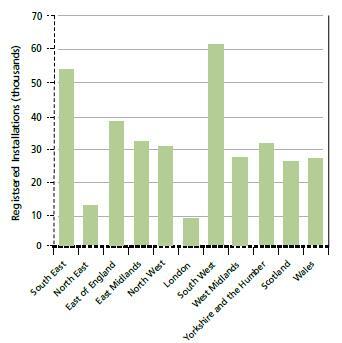 See graph from FIT report below highlighting the number of installations by region. Previous posts discuss London’s slow performance on FIT take up here. February 2013: Ofgem have posted an updated list of tariff rates under the Feed-in Tariff scheme for PV installations. A lot more involved now! Download here. January 2013: Tim Starley Grainger has posted some useful graphics on how London is faring under some key Government energy efficiency and renewable energy programmes, such as CERT, Warm Front and progress under the Feed in Tariffs (FITs). As highlighted in various posts on this site, it doesn’t make for cheerful viewing. Graphics posted here. 17 December 2012: John Pugh, MP for Southport, has asked a useful parliamentary question around what the Government’s position is on promoting the generation of electricity by local authorities. Apparently it has one. Col 534W: John Pugh: To ask the Secretary of State for Energy and Climate Change what his policy is on the generation of electricity by local authorities; and if he will make a statement. Gregory Barker: In 2010, we gave local authorities the power to sell electricity generated from renewable sources. It is therefore up to local authorities to generate and sell electricity if they wish and we are encouraging them to do so where this is appropriate. We have also facilitated this through ‘lite’ electricity supply licence, which would allow a local authority district heating operator to sell electricity at retail rates to consumers. We are also supporting community ownership of localised renewable energy projects through the Feed-in-Tariffs scheme. Local projects engage neighbourhoods and communities in becoming involved with generating local heat and power e.g. Combined Heat and Power with District Heating (CHP-DH) networks in Woking, Southampton, Nottingham and Sheffield. Local authorities also have a role in encouraging energy efficiency take up, including the Green Deal, and looking after consumer interests, for example, through the pioneer places and core cities initiatives and through supporting or running collective switching schemes. Further to the link to the 2010 DECC news release (above) granting powers to local authorities to be able to sell renewable power – additional information is provided in this letter from the then Secretary of State to local authority Chief Executives ‘Unlocking Local Power‘ . Little progress has been made on the so-called ‘lite’ electricity supply licence: no local authorities have actually applied to hold a licence since Ofgem introduced this opportunity in March 2009. The GLA have however recently announced that they will – more on this in an earlier post. For the latest on FITs for Community Energy schemes – see the following post. All the neighbourhood heat and power schemes referenced in the PQ – though excellent – were all developed decades ago. Whilst good to see that these schemes are still expanding their heat networks, it would have been more encouraging to highlight progress in some new city-wide district heating schemes – however Government support in this area has been extremely limited. December 2012: Ofgem draft guidance document, open for consultation. It provides specific guidance for solar PV community energy and school installations on how to benefit from provisions available for the FIT scheme. Further information on community energy and school installations can be found in the following DECC FIT FAQ document and the latest FIT rates here. 12 March 2012: “An electrician who invested his life savings to set up his dream solar panel business could be left with nothing because of new government policy. Russell Lyne, 31, who lives in Highbury Quadrant, Highbury, spent two years saving and took out a bank loan to raise the £25,000 he needed to set up UK Solar Generation.” Read the full Islington Gazette story here. 7 March 2012: Interesting account posted on the Low Carbon Communities Network website of Merton based solar initiative ‘Juice your Roof’ meeting new DECC Secretary of State – and London MP for Kingston and Surbiton – Ed Davey.